Oblong folio (30 x 44 cm), unpaginated, consisting of 40 numbered lithographed plates, including a folding panorama of the Sinai, numbered 6-8, all very attractively coloured by hand, a vignette which has been coloured by hand as well opposite the title page, plus one uncoloured plan. Most plates are accompanied by one page of descriptive letterpress. The reverse side of the plates is blank, the reverse side of the text pages as well, with the exception only in a very few instances where the accompanying text takes more than one page. Handsome modern calf over marbled boards. Flat spine, gilt ruled in six compartments, with the titles in gilt in the second and third compartment. Very generous margins. Some unobtrusive, very light staining in the upper, far out fore margin of some plates towards the end, but overall internally an exceptionally clean copy. This book was originally published in Stuttgart by Steinkopf in the same year with in total the same 40 (i.e. 41) plates. Sometimes, when looking for library resources, 4 volumes are mentioned. However, the 3 volumes of 'Reise in das Morgenland' by Von Schubert alone were already published the year before and are not to be considered a part of this publication. For this edition the text by Von Schubert was translated into Dutch, while the original stones of the German edition have been used, hence the captions under the plates are in German. What makes this Dutch edition more attractive than the original German edition is the paper format. Although the lithographs are the same, the Dutch edition has been printed and bound as a folio edition, resulting in much wider margins. The size of the German quarto edition is about 25 x 32 cm, so quite obviously much smaller than this edition. These first editions in German and Dutch only were available with (black and white) lithographs. The later editions which appeared from 1842 onwards, though in various smaller formats, were available with tinted and/or chromolithographs as well. In these later editions the accompanying texts for the first time were printed in English and French too. Despite the title, only 23 of the 40 plates depict places in the “Holy Land” (Palestine), including a spectacular view on Jerusalem. The other 17 plates depict places like Heliopolis, Ephesus, Damascus, etc. 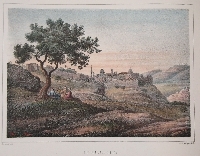 Johann Martin Bernatz and Gotthilf Heinrich von Schubert travelled in the Levant during the years 1836-37. Von Schubert first published his account of these travels in 1838 under the title ‘Reise in das Morgenland’, followed by this book in 1839 with the lithographs after Bernatz. Bernatz was a well known 19th century landscape and architectural painter, appreciated most because of the preciseness of detail with which he drew his pictures. Copies of the large oblong 1839 quarto edition are scarce and copies of the folio editon are rare, but those with hand-coloured plates are extremely rare; the copy on sale here was sold at Sotheby's at their sale of 24th October 1996 and sold again by Bloomsbury at their sale of November 1st, 2007. No other copy with the lithographs coloured by hand, either of this Dutch edition or of the German edition, ever appeared at another auction. A handsome copy with the lithographs exquisitely coloured by hand.